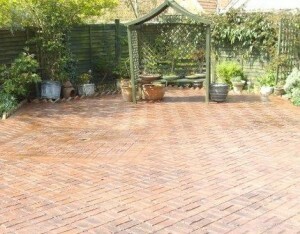 Unlike concrete block paving and stone cobbles, fresh concrete is one of the few perishable materials used in the construction industry because when it is delivered as ready mixed concrete there is only a certain time to lay it in the place and form required before it is too hard to work with. Too much concrete, too little manpower, too few printing mats and warm weather is a combination sure to result in a rushed job where it is more than likely that the concrete surface will be too hard to print properly. Typically there would be six rigid printing mats and one flexible mat in a set. There should be at least enough rigid mats to span the narrowest section of the driveway and the flexible mat is used to access areas where a rigid mat would not fit. Most printing mats are between one third and one half of a square metre in size. There are a number of important factors in achieving colour consistency when installing pattern imprinted concrete and as to be expected they involve the use of colour surface hardener and antique release agent. Insufficient colour surface hardener will result in a patchy, inconsistent appearance across the new pattern imprinted concrete surface, especially on larger jobs which require more than one delivery of ready mixed concrete. One delivery of concrete could be a slightly different shade or contain slightly more water than the next and only the liberal application of sufficient colour surface hardener can deal with this. This is especially important when the area is so large that it takes more than one day to lay the concrete. A quality installation of pattern imprinted concrete will require a minimum of 2.5 kilograms of colour surface hardener applied per square metre. 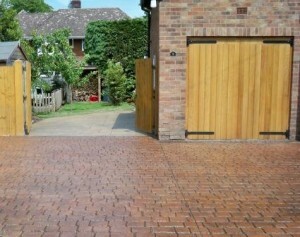 In high wear areas such as the entrance to the driveway and around steps, more colour surface hardener should be applied. Most pattern imprinted concrete companies use colour surface hardener rather than ordering concrete which is already coloured all way through. It may sound better at the point of sale for a salesman to claim that their concrete has integral colouring rather than just on the surface. However, installing concrete which is coloured throughout denies the opportunity of strengthening the surface with colour surface hardener. Also, if the concrete is not thoroughly mixed, it can result in a patchy surface, so much so that the operator of the world’s largest theme parks insist that colour surface hardener, rather than integral colour, is used on all of their pattern imprinted concrete installations. Before the antique release agent is washed off, the surface appears much darker than your chosen colour. However, once it is washed off with a release agent wash, plenty of water and then a mild acid wash, the surface colour should resemble your required colour. Not removing all the antique release agent can cause the sealant to fail as it will not bond to the concrete where excess antique release agent remains. This can result in a patchy appearance, the only solution for which is to remove the sealant and start the cleaning and sealing process again. The thickness, compaction and type of material used for the stone sub-base, together with the integrity of the sub-grade, (that is, the firm ground below it) and the correctly prescribed mix of concrete all play their part in ensuring the long term success of the pattern imprinted concrete paving, especially if it is a driveway expected to cope with vehicular rather than just pedestrian traffic. Not surprisingly, the application of colour surface hardener is also important, in strengthening the surface and improving its impact resistance. 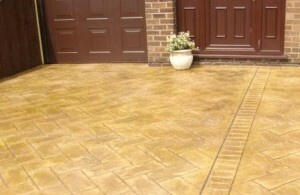 For an installation of pattern imprinted concrete to acquire long term durability it will require a minimum of 2.5 kilograms of colour surface hardener applied per square metre and in high wear areas such as at the entrance to the driveway and garage, together with the area around steps, more should be applied. Concrete used for pattern imprinted concrete driveways should have a minimum of 320 kilograms of cement per cubic metre, with more in cold weather. It should also be fibre reinforced and have an air entraining agent, all of which improve the durability and strength of the concrete and help to reduce the potential for later cracking. The surface of ordinary concrete will still be strengthened with the application of colour surface hardener but it will be more liable to cracking if it is the wrong mix. Quite simply, a thicker slab of the correctly prescribed concrete is less likely to crack than a thinner one. For driveways the minimum should be 100 mm thick and for pedestrian areas such as rear patios the minimum should be 75 mm. On highly trafficked areas or where, for whatever reason, crack control joints cannot be cut in, the concrete should be thicker; 150 mm for domestic paved areas. Some pattern imprinted concrete installation companies refuse to use a polythene sheet between the stone sub-base and the concrete on the grounds that it holds water in the concrete for too long (rather than allowing it to bleed into the stone) and the resulting excess water can spoil the print. The opposing argument to this is that the polythene acts as a slip membrane between the stone and the hardened concrete slab, allowing the concrete to move independently. The ability of the slab to move will reduce the build-up of stress and mean that it is less likely to crack. This argument between the two opposing sides will never be solved and it is down to the installation company to decide whether a slip membrane is required for a particular job, given its unique set of characteristics. A pattern imprinted concrete contractor then has to stand or fall by his or her own decisions. The issue of movement joints being cut into concrete slabs is sometimes a difficult one to deal with and reputable companies have turned down work for customers who have refused to have them in their pattern imprinted concrete paving. Movement joints in concrete are invariably contraction joints, (sometime referred to as crack control joints, they are not expansion joints) and should be considered the least-worst option. They should be positioned where the concrete is likely to crack so that the installer can have at least some control over the cracking which will inevitably occur, rather than allowing the concrete to crack randomly over its surface. Crack control joints should be cut in positions of high stress such as at the external corners of buildings where contracting concrete is trying to pull in two directions (i.e. from a line at 45º to the external corner). Additionally, to help reduce random cracking, maximum slab size within the whole paved area should be restricted to 20 m² and should have a maximum length to width ratio of 2:1, hence a three metre wide driveway should have a contraction joint every six metres. Unsurprisingly, if a concrete slab is expected to randomly crack without contraction joints being cut in, it makes sense to make those cuts sooner rather than later. The type and position of the contraction joint will determine whether it is cut before or after the slab has cured, or hardened. A soft cut made on the day of the pour should be between a quarter and a third of the depth of the concrete and a diamond saw cut made later should be between one third and a half of the concrete depth. Cuts are never made right way through the concrete slab. The intention is that if stress within the concrete is about to result in a crack, that crack will occur in the remaining uncut part of the contraction joint. In this way there will be no change in the appearance of the concrete surface as there would have been in the case of random cracking. Solvent-based acrylic sealants should be used for pattern imprinted concrete surfaces rather than water-based acrylic sealants as they are far easier to remedy if problems occur. Neither can be used unless the concrete surface is completely dry so other than the difficulty in rectification work and cost there is little reason to use a water-based sealant. Pattern imprinted concrete will look better if it is re-sealed every three to five years and this is a relatively simple procedure with solvent-based sealants. It is much more difficult with water-based sealants. 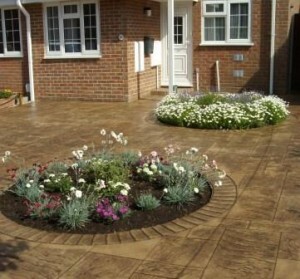 Other than re-sealing every few years, pattern imprinted concrete is relatively maintenance free and weeds should not grow through it, as they can with block paving and tarmacadam. However, unless the surface cuts made to create crack control joints are filled with silicone, weeds can develop in the joints. Filling the joints with an appropriately coloured or neutral silicone sealant will not only look better, it will also prevent the build-up of dirt and small stones. Stones can damage the cut edge of the concrete and dirt can provide a base for weed growth.